Favorite Finds are items that aren’t necessarily designed for travel but pack well and have come in handy for me on the road. 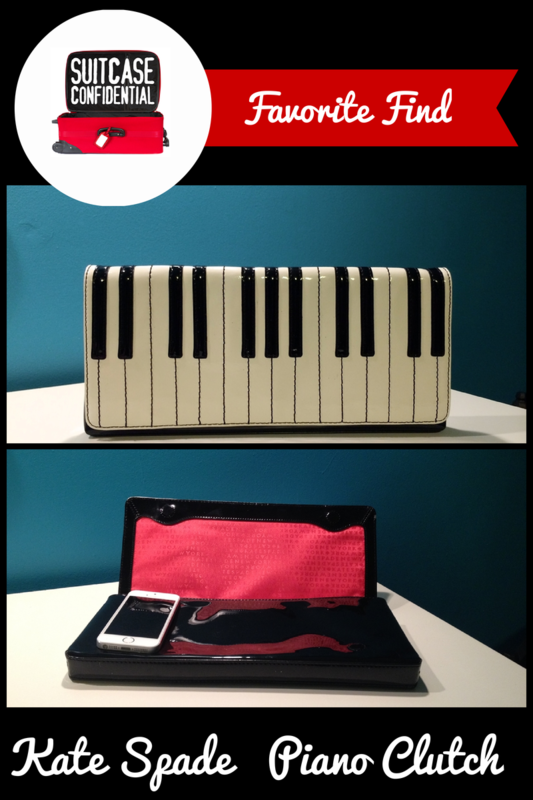 This week’s Favorite Find is my Kate Spade Piano Clutch. In addition to be a self-proclaimed overpacker, I’m also a purse fanatic. I’ve been on a bit of a Kate Spade binge lately because the brand produces fun, quirky pieces that are great conversation starters (which are good when you do a lot of networking at events). I found this gem during a great sale when I was looking for a graduation present for one of my family members. I snagged one for her and one for me (even though I actually don’t play the piano). Best. decision. ever. Packs easily.The clutch is long, relatively thin and flat, making it easily packable. I’ve packed it in my messenger bag and in my carry-on; it fits nicely in both. Perfect size. It’s large enough to hold everything I need for a night out, particularly when I’m traveling on business. I’ve been known to pack a small wallet, glasses, powder, lipstick, business cards, gum and two phones (one business and one personal). Statement piece. It’s a great conversation starter, and I get tons of compliments on it. Goes with everything. ’nuff said. This one is from last season, so you likely won’t find it in the current collection at Kate Spade. However, there’s always the possibility that it will end up at the outlets and/or make an appearance in one of the Surprise Sales. Sign up for emails from KateSpade.com and like them on Facebook to be alerted the next time one of those happens. And, I haven’t looked, but you can always check eBay. Just be wary of fakes. Do you have any favorite purses that you travel with? Share yours in the comments below!